Metro is holding three series of community meetings beginning later this month on the Artesia-to-downtown Los Angeles light rail project, also known as the West Santa Ana Branch Transit Corridor (project home page here). The environmental study for the project is underway and the Metro Board of Directors in December approved a series of project refinements — which will be discussed at the meetings. 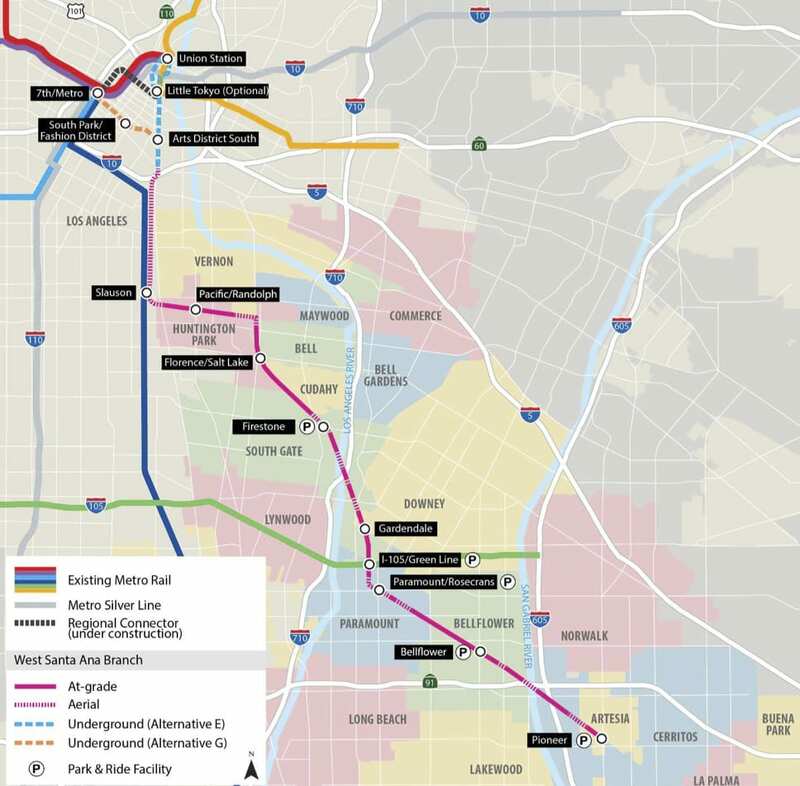 •Aerial structure over the I-10 freeway will be added; this structure will begin on the north side of the freeway and continue south to the Slauson Station. •Five aerial grade separations will be added along the corridor. –Three proposed stations (Washington, Vernon, and 183rd/Gridley). –Optional Bloomfield extension and station. –Alternative G2 (the Pershing Square design option). Still under study for the terminal station in DTLA are two locations: Union Station and 8th & Flower (which is adjacent to 7th/Metro Station). As directed by the Board, a separate Feasibility Study will be conducted for a potential station at the L.A. River and Rio Hondo confluence site in South Gate to determine whether to advance it into environmental review after the completion of the environmental process. Are there plans regarding the use of Randolph Blvd in Huntington Park to not preclude for the future line between La Habra, Whittier, Pico Rivera, Huntington Park, South Los Angeles, Inglewood, and LAX? This would share the Randolph corridor with the UP and use the agency owned Slauson corridor and share the Crenshaw line to LAX. It is important that the Artesia line is built so that a future La Habra and LAX can be built without having to modify the Artesia/Santa Ana line in the future. I am good with this project from Slauson south to Artesia in terms of station sites, bridges etc. My problem is from there north. Many issues. 1/ Need the Washington stop back. WSAB passengers should station on their trains as far as Washington before dumping onto the already crowded Blue Line trains . 2/ Slauson to Washington needs to be elevated not only on the WSAB line, but time to elevate the Blue on this section also. 3/ Why does the line need to go OVER the I-10 freeway? That is an incredible high bridge, just subway it as you are already doing subway north of there. 6/ If you go to 7/Flower, make sure this line can then be extended past the Harbor Freeway to Beaudry District, Echo Park and Silver Lake areas. 7/ Still thing Pershing Square should have been left in the mix as a transfer, as long as you could some day extend it to 5th/Flower (a station that should have been built on the Regional Connector for this purpose), so then WSAB after connecting with the RED/PURPLE subways at Pershing, could have connected with BLUE/GOLD light rails at 5/Flower before then heading west of the Harbor Freeway- Beaudry, Echo Park, Silver Lake etc.. Another cross downtown route. I wonder if that would the highest light rail bridge in the country. I am at a loss as to what would be higher. It would be a huge structure. I don’t know what it would be trying to avoid. I don’t get the reference? Is that old Los Angeles Railway line? I’m afriad bringing more homeless to area. If there was a station in Little Tokyo, would it be a part of of the subway station that is being built? Would it be on the surface? Would it be new underground platforms? What would it even be? Both alternatives for the downtown portion of the line would be entirely underground. In Little Tokyo the station would connect to the new one being built for the Regional Connector. All the December project refinements killed this project for me. This could have been the start of a great line. Now it’s just a mess and waste of money. What do you think should be added in? The new WSAB line needs to have track connections (i.e., crossovers) to the Blue Line, at or north of Slauson. This would give Metro some flexibility, by allowing Metro to reroute trains if either line has a break. This is just common sense. One day in the future, Metro is going to want to grade-separate the Blue Line along Washington Blvd. Having the ability to temporarily use the WSAB tracks into Downtown LA would allow the Blue Line to keep running, even if at a lower capacity. I implore you: build a four-track right-of-way over Slauson. Think ahead. Honestly both ends really ought to be built in the long run. They both have advantages and ultimately lead to more service possibilities for respective extensions, the 8th/flower terminus gives us a historic core station and connects to all four existing downtown lines at 7th. It could continue west and then curve north somewhere around Alvarado and into the silver lake – echo park area and then head west along Santa Monica Blvd. to West Hollywood, (which would consequently allow the crenshaw north extension to have a straighter route via la brea or at least fairfax). The union station terminus could then be extended north to Glendale, which of course is becoming its own pretty dense urban center for the LA area and certainly warrants a below-grade LRT running down either Brand Or Central blvds. Naturally this line would connect to or at least allow a transfer to the east-west Noho – Pasadena line as well. Given funding I guess only one terminus is planned to be built right now but there ought to be serious consideration for building both if funding can be made available.